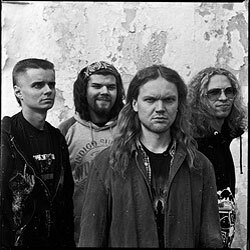 The Moscow instrumental prog-doom-metal combo ENDNAME was formed in 2007 by Dmitry Musatov (drums, electronics), Sergei Kaplin (guitars) and Sergo Meshidze (guitars) when their previous bands, SOULAR and ROUT[e] came to an end. 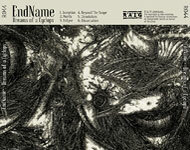 In early 2009, the trio recorded their debut 4-track EP enitled Dissociation, and soon was reinforced with Sergei Podgornyi (bass, synthesizers). Later that year, the band made successful stage appearances at the Moscow Doom Festival IV and the Metal Heads Mission Festival in Crimea. 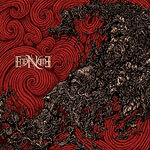 ENDNAME's instrumental compositions lean more towards the doom- and sludge-metal spectrum but still absorbs the influences of progressive metal, post-metal, math-rock, etc. For more information and direct contact please visit ENDNAME's official site. Free streaming or immediate digital download of the album (in your choice of MP3-320, FLAC, or just about any other format) is available through Official R.A.I.G. Bandcamp. "This is a very rich and diverse album that draw on many different influences, many whom I have a hard time placing. The music is really fascinating... Dreams Of A Cyclops would clearly be of most interest to fans of Pelican, 5ive, Neurosis, and other bands of approximately that style. Additionally, appreciating soundscape music shouldn't be underestimated as an incentive. Moreover, since this is a band who hold a high standard of musicianship it might even appeal to many outside that fanbase. Being so unusual as they are, they might even deserve to label their own separate fanbase. I sincerely hope that the Eastern European origins of this album won't force this band out of history because, to my ears at least, this band deserves to be acknowledged right alongside the best of it's kind." – by Arnstein H. Pettersen at Doom-metal.com (Belgium) (October 2009). "The first album from this Moscow-based instrumental space-metal group has the heavy prog feel but it's injected into a super heavy sludge/doom weightiness that often sounds like a kind of stately prog-doom. These guys have been compared to Pelican a bit, and there's definitely some of that sound going on here, but EndName add a bunch of their own eccentric sounds and turn it into something uniquely theirs, a mix of instrumental King Crimson -influenced prog, winding doom riffing, space rock atmospherics and quirky electronic soundscaping that puts an emphasis on heavy, hypnotic grooves, incorporating lots of synthesizer, Frippy guitar work, tribal percussion and even didgeridoo into their odd art-metal. The proggy math-doom workout of opener 'Inception' goes from stuttering Meshuggah -like riffage and cascading sheets of processed guitar into a repetitious, sinister doom metal riff driven by a lurching angular rhythm and constant harmonic squeals. 'North' is slow pounding doom metal mixed with symphonic synth strings and pounding industrial clang, a lumbering cinematic doom instrumental that opens up into weirdly sunny melodic passages, soaring FX-heavy guitar solos, and some baroque Ren Faire keyboards towards the end that makes this sound like some weird proggy 80's doom. The fourteen minute 'Eclipse' has Floydian guitar atmospherics flowing into an epic 80's metal/cop show groove with propulsive drums and melodic metallic riffing, a killer hook at the center of it, breaking of into tribal hand-drum percussion and atmospheric droning; halfway into it, the track starts to sound like older Pelican jamming with a drum circle before slipping back into that killer quasi-disco groove, then gets all spacey at the end with odd countrified guitars and more hand percussion. Heavy stop-start riffing dominates 'Beyond The Scope' with an almost Helmet / Gore style groove, heavy angular sludge rock with creepy spacey lead guitar. 'Dissolution' opens with delayed didgeridoo drones and spacey synth drift, a deep cosmic ambience streaked with backwards guitar, chimes, buried electronic pulse, and synth strings, a total krautrock-inspired dronescape a la Tangerine Dream / Klaus Schulze, an eerie descending melody gradually returning to the ominous didgeridoo buzz. And closer 'Dissociation' returns to the massive processed slabs of progged out sludge metal with another lumbering stop/start riff and more sheets of FX-heavy guitar, crushing plodding drone-riffage and swirling cosmic synths merging into a slow and propulsive groove, the drums a mechanical tick-tock pulse, riffs constantly changing and chugging, the drums blasting off into volleys of ferocious double bass later on, joined by percussive clang and crashing cymbals, mutating into a frenzy of spaced out thrash metal riffing at the very end." – by Adam Wright-Carmean at Crucial Blast (USA) (January 2010). 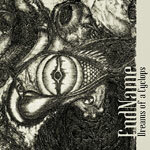 "EndName play a instrumental multi-dimensional, multi-layered assault of different metallic textures which is driven by some incredible guitar work. They lay down some wild riffage at times which is accented with electronic sounds while remaining extremely heavy with a bleak atmosphere. So diverse is their musical canvas that pin-pointing influences is close to impossible and really irrelevant. This is a album that flows incredibly well, so much so that if you not paying attention, you could assume its just one single epic track. They also manage to avoid all the usual cliches found in usual instrumental metal bands by creating a wall of sound that is rich in diversity by adding elements like tribal percussion's... As a big fan of instrumental albums, this is one of the best i have heard from the doom / sludge side of the fence. Chugging and plodding in places but forever changing, 'Dreams Of A Cyclops' is a hard album to ever get bored with. The irresistible, flawless way the songs flow make this a essential piece of work for the sludge / doom fan looking for something unique. It must also be noted, the great musicianship which is breath-taking at times and jaw-dropping at other times in its sonic intensity. Fans of early Neurosis, Isis and Pelican will dig this as well will lovers of pure guitar riff indulgence, there is also something for the sludge and doom fan but if you are looking for something outside of the usual, this is for you. The sound and production is crisp but also not over-produced and this recording is loud so crank it up. Highly recommend this one. (9/10)" – by Ed Barnard at Doommantia (USA) (June 2010). The album was also reviewed at: Metalizer (Russia), Metal Library (Russia), Your Reality. Free Entrance /¹7/ (Russia), Dark City (Russia), Rockcor (Russia), Monochrom-Cracked (Austria), Sea Of Tranquility (USA), Neformat's interview with EndName (Ukraine), Far From Moscow (USA), Metal Zone (Ukraine), Winter Torment (USA), DisAgreement (Luxembourg), Neformat (Ukraine), Music Waves (France), Concrete Web (Belgium), Aristocrazia (Italy), Heavy Planet (USA).